Primula wangii F. H. Chen & C. M. Hu, Fl. Reipubl. Popularis Sin. 59(2): 291. 1990. Type specimen: C.W. Wang et Y. Liu 87568 resides at WUK (specimen 0275454) and KUN (specimen 484138). Type specimen: L. H. Chen 92269 resides at ? Additional specimen: Hao Gang 666 resides at Paris (specimen P05219058). 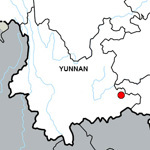 Distribution: Guangnan Xian, Yanzidong and Fengshan Xian, Yunfengdong, Yunnan,China.